One of the ways to improve and maintain your oral health is to visit your dentist for preventive care. These appointments ensure that your mouth, teeth and gums are thoroughly cleaned and that any developing issues are detected and corrected before they mushroom into something far worse. For some people, though, the thought of visiting the dentist brings about fear and anxiety. Understanding that these appointments are essential, can anything be done to overcome these feelings? Your dentist in Gahanna weighs in with 3 helpful tips. Scary Stories – Everyone’s heard the horror stories about visits to the dentist. For some people, even if it’s not their experience, they can be negatively affected by these stories. Fear of Pain – Some people have an acute fear of pain and may worry about being helplessly restrained in the chair while forced to endure it. A Bad Past Experience – For others, there may have been a bad experience – usually from childhood – that stained their memories. The trauma from that experience can spill over into adulthood. Embarrassment – Finally, a patient may simply have anxiety due to embarrassment. 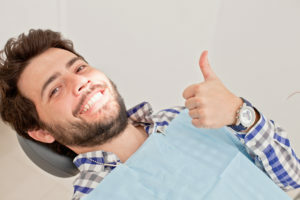 Those with poor oral hygiene and who haven’t attended a visit in a long time may be apprehensive for fear of chastisement about the condition of his or her teeth. Communicate – Whether it’s with the dental hygienist or the dentist, you shouldn’t be hesitant to discuss your apprehension about receiving care. Because the professionals at your dentist’s office are experienced and well-trained, they will reassure you that you’re not the only person who’s felt like this and will offer remedies. Relaxation Techniques – One method to overcome anxiety is to perform relaxation techniques. You can try alternative breathing methods, exercise and distraction techniques such as talking to the staff to calm your nerves. Treatment for Acute Phobias – For more acute fears, your dentist may refer you to a specialist. This trained professional will be able to help you identify the root cause of your phobia, so that you can move past it to get the dental care you need. When working with the professionals at Anderson Family Dental, you’ll enjoy the fact that it’s a “no judgment” environment. The first step to getting the help you need is to reach out to schedule a consultation. While there, you can let the dentist know about any hesitance you may have, so you can get help. A graduate of the University of Kentucky, where she earned her Doctor of Dental Medicine degree, Dr. Joy Todd has been providing expert care for nearly two decades. She takes pride in helping patients solve problems and overcome challenges, so they can experience the absolute best in dental care. Dr. Todd practices at Anderson Family Dental and can be reached for more information through her website.